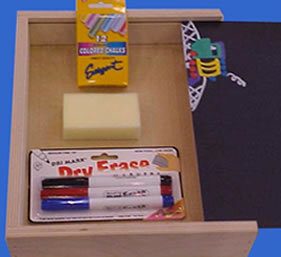 A Personalized Chalk Box is a chalk board storage box - chalk board on one side, dry erase board on the other, and it slides open for storage. 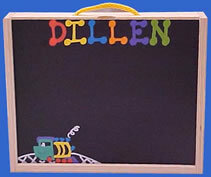 Have it personalized with a child's name, and choose from eight available designs. Great in the car, for traveling, restaurants, etc. 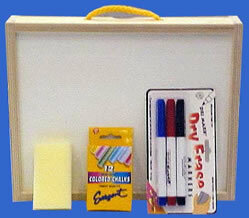 Also available with supply set including colored chalk, dry erase markers, and an eraser. Each Personalized Chalk Box is hand painted in vibrant, happy colors by self-taught artist Karen Kennedy. Her whimsical, fun spirit is reflected in each original hand painted design and colorful lettering. Karen grew up in Milford, Michigan and travels all over the country doing art shows where she hand paints designs and personalizes the child's name in colorful letters right on the spot.